Come aboard with carver Mike Shipley as he shows you how to carve a sea-worthy old sailor and his crew. 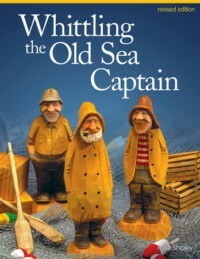 More than 100 step-by-step photos guide you in carving painting and staining the salty Old Sea Captain and his first and second mates. Patterns are also included for making buoys lobster traps and wooden crates to set an entire sea-faring scene. Includes step-by-step carving & painting demonstrations patterns and color photos of the finished crew.